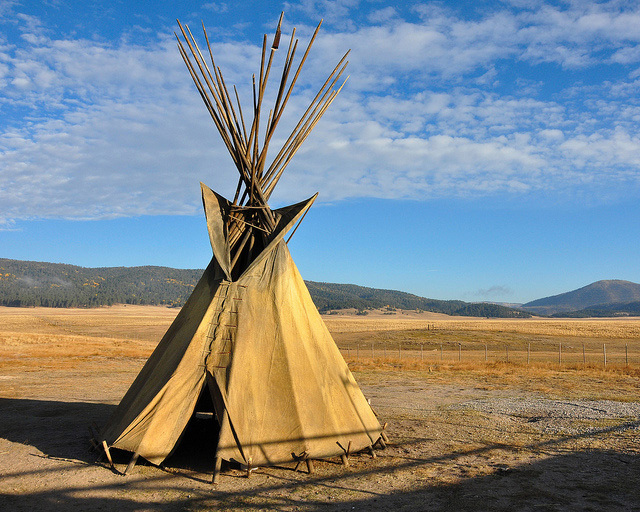 Teepee; photo by Larry Lamsa on Flickr (use permitted with attribution). Focus is the area along the Clear Fork of the Brazos River. The story is recalled by an old-timer of the region - a cattleman who sits on the porch of a ranch house to reveal the past as he remembers it. The production consists of a series of segments, each based on historical material introduced by the narrators and then interpreted by one or more songs and dancing. Held in Palo Duro Canyon in a natural amphitheater - performed under the stars - a 600-foot cliff serves as the backdrop as you are taken into the past to reveal the struggles and celebrations of the early settlers, cowboys and native Americans. Presented in Galveston Island State Park Amphitheatre - part of the "Lone Star Legacy" festival. Galveston Island State Park has an interesting 500 year history. An outdoor Drama held by the Alabama-Coushatta Reservation. Last produced in 1983. The origin of theater goes back to prehistoric people acting out their hunting experiences and ancients singing and dancing for religious ceremonies.